The 22-year-old is out of contract at the end of this season and the Toffees have agreed a fee which is likely to be worth up to Â£5million. 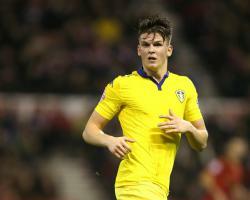 Everton will now discuss personal terms with Byram, who has been extensively scouted by a number of Premier League clubs. Byram is a long-term option which could provide a short-term fix as manager Roberto Martinez is currently short of cover at right-back. Republic of Ireland international Seamus Coleman is sidelined for another three weeks with a calf strain sustained in last week's Capital One Cup semi-final first-leg victory over Manchester City, while Tyias Browning has been ruled out for the season with a knee injury and veteran Tony Hibbert's fitness issues mean he has not played a match in 13 months. John Stones, who has established himself as first choice in the centre of defence alongside captain Phil Jagielka, filled the void in Wednesday's goalless draw at Manchester City but the arrival of Byram, a Leeds academy graduate who has turned down the offer of a new contract, would give Martinez some much-needed back-up. Everton boss Roberto Martinez is hopeful of adding to his squad before the end of the January transfer window. The Toffees have already signed youngsters Shani Tarashaj and Matthew Foulds for the long term but Martinez is now looking for recruits to make an impact during the second half of the season. Dynamo Kiev striker Andriy Yarmolenko is a player Everton have been consistently linked with over several windows. Martinez claimed he did not know the Ukrainian's agent was at Goodison Park for the FA Cup win over Dagenham on Saturday but confirmed he has irons in the fire. The shape of the squad is going to be determined in the last week of the window and we want the squad to be stronger than it is now." 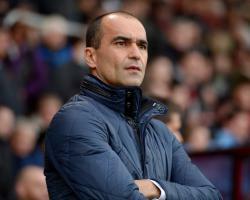 Martinez is also hoping to offload a couple of players on the fringes of the squad. 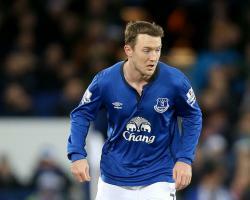 Winger Aiden McGeady was left out against Dagenham because three clubs, two domestic and one from abroad, have shown an interest in taking him on loan. Midfielder Darron Gibson could leave on similar terms while forward Steven Naismith has been the subject of enquiries from Norwich and another Premier League club. There's been three enquiries and it's going to be over the next couple of weeks that we're going to make the final decision. "It would be a loan until the end of the season and (he and Gibson) would be returning and competing strongly in pre-season in view of the next campaign." 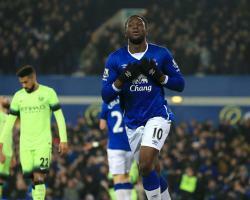 Everton return to Premier League action on Wednesday with a trip to the Etihad Stadium to face Manchester City. Martinez is looking for a repeat of the first leg of the Capital One Cup semi-final last week, when they produced one of their best displays of the season to win 2-1. That avenged a 2-0 home defeat in the league in August, with the second leg of the cup clash to come in a fortnight. We're looking to go to the Etihad and face the team with the best home record in the league. I can see a really tight game and the familiarity between the two sides can only help to make it a more interesting encounter if anything." Romelu Lukaku will lead the line after recovering from an ankle problem and Ramiro Funes Mori is fit despite needing 10 stitches in a head wound sustained against Dagenham. Tom Cleverley is a doubt because of an ankle problem while Seamus Coleman's calf injury will keep him out for another two weeks or so. Martinez confirmed, meanwhile, that Tim Howard will return in goal despite a shaky season and Joel Robles' good form in the cups. The Spaniard said: "Joel Robles has been terrific but Tim brings a unique experience and know-how. "Of course you get good moments and bad moments like any player but we appreciate what Tim Howard brings on top of being in between the sticks." The 21 year old centre back has gone from strength to strength since breaking into the Everton first team back in 2013 and has earned himself links to top clubs such as Chelsea, Barcelona and Manchester United, as well as earning 7 appearances for his country. From John Stones perspective though a move to Chelsea(still in the Champions League despite their poor form) is a chance to better himself playing with world class players not to mention a big pay rise (not that IÂm suggesting he is money motivated) People often criticise footballers for their lack of loyalty but a chance to work at a better company for more money IÂm not sure how many people would turn that down. The blues have had massive defensive problems this season without their skipper Vincent Kompany for the most part and Stones could help strengthen CityÂs back four, City will probably remain outsiders despite having the funds due to already spending more than Â£60m on the current partnership of Otamendi and Mangala. He would also become the first Englishmen to play for the Spanish giants since Gary Linekar back in 1989. One thing is for sure that if John Stones carries on performing the way he has done it would be hard to see him still at Everton come the 2016/17 season. Do you have a passion for Everton and a way with words? Everton Mad are looking for contributors for the start of the new season. If you're a blogger looking for a new challenge and a bigger audience, or just a fan with a desire to wax lyrical about your team we want to hear from you. If you want to write regular articles about Everton, whether they be match reports, transfer news, opinion pieces or stats analysis please get in touch. Everton have signed Switzerland Under-21 forward Shani Tarashaj on a four-and-a-half-year deal. The 20-year-old joins from Grasshoppers and will be loaned back to the Zurich club for the remainder of the 2015-16 season to allow him to complete his national service. No fee was announced by Everton but it has been reported as being Â£3million. We're delighted to have found a young player who believes that our club is the perfect step for him to enhance his quality and to grow his career. He is a family boy, hungry and he is desperate to fight for his place in our talented young squad." I am proud and so happy to be here." Substitute Jesus Navas looked to have given the visitors the advantage with a 76th-minute counter-attack goal to cancel out Ramiro Funes Mori's opener on the stroke of half-time. However, Lukaku rose to power home a perfect Gareth Barry cross less than two minutes later for his 12th goal in as many matches to swing the momentum back in his side's favour – but only just. 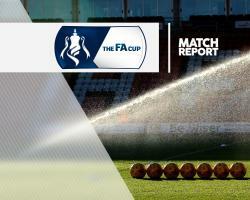 The sight of him limping off late on was an initial concern but manager Roberto Martinez played down the injury scare, although the Belgium international is unlikely to be risked in Saturday's FA Cup tie at home to Dagenham and Redbridge. I don't know if he will be available for the weekend but I don't think it is too serious," said Martinez, who has greater worries over midfielder Tom Cleverley and right-back Seamus Coleman. "Tom and Seamus are very similar, Seamus with his calf is probably the most serious, those things are between three to four weeks." Everton withstood City's early huffing and puffing without much threat and eventually seized control of midfield with Mo Besic and Gareth Barry, 35 next month, both excellent. 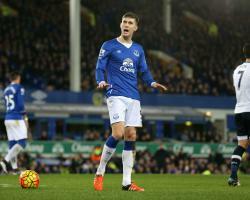 "Gareth Barry is one of those players that gets under-rated," said the Toffees boss. "For me the big reason why we have so many effective young players is there are leaders in the mould of Gareth. For me he is one of the best English players ever. You can build a team around him." City boss Manuel Pellegrini has injury worries of his own after Eliaquim Mangala was substituted at half-time to join fellow centre-back Vincent Kompany on the sidelines. "Yes of course it is a problem," he said. It is a lot of games." Pellegrini was even less happy with the performance of referee Robert Madeley after he allowed Funes Mori's goal to stand despite Lukaku being in an offside position in front of goalkeeper Willy Caballero and then failed to award a penalty late on for a foul on Navas. "The first goal is absolutely offside, Lukaku is one yard in front of Caballero and he makes the movement and then there is a clear penalty on Jesus Navas," he added. We lost 2-1 but I think we are still able to play in the final of the Capital One Cup. "Maybe everyone can have his opinion about every game, playing away, playing at home, it was not the score we wanted to have but it is the score that playing two legs, you can win." The Belgium international's 19th goal of an increasingly impressive season capped a dominant Toffees' performance against the three-time League Cup winners – but it came at a cost as the striker limped off with nine minutes to go. Centre-back Ramiro Funes Mori had given the hosts the lead on the stroke of half-time before substitute Jesus Navas' first goal since September 2014 levelled things up with 14 minutes to go – but that lasted for less than two minutes. Roberto Martinez's unbeaten record at Goodison in cup matches extends to nine matches, with seven wins as manager of Everton and previously Wigan. A talking point before kick-off was both sides' change of goalkeeper – Martinez restoring Joel Robles for the cup competition – although there has been a growing clamour for the Spaniard to be given a longer run at the expense of Tim Howard – and Willy Caballero replacing Joe Hart. They were decisions which proved to be instrumental as Everton's number one made an excellent save from Kevin de Bruyne in the second half, while Hart might have dealt better with Ross Barkley's shot better which led to the opening goal. Funes Mori rammed home the rebound in first-half added time after Caballero, possibly distracted by Lukaku in an offside position in front of him, pushed the ball straight back out instead of diverting it sideways away from danger. It capped a cagey first half in which City appeared to be going through the motions – Yaya Toure a notable offender as he found himself in the pocket of the excellent Mo Besic – with De Bruyne and David Silva shooting wide and Nicolas Otamendi off-target with a header. It led to a tense atmosphere inside Goodison which was only broken by the second loudest cheer of the night, when Besic tracked back to dispossess Toure with a brilliant recovering tackle. Everton twice had the ball in the net through John Stones and Lukaku, only to be rightly flagged for offside on both occasions – even if they did appear to benefit from the lack of a linesman's flag when it really counted. Robles had hardly been tested but he reacted well to parry Sergio Aguero's shot and Funes Mori blocked the Argentinian's rebounded effort before taking greater decisive action at the other end. Aguero, rarely involved for an hour, sliced a good opportunity wide and Fernandinho headed into the arms of Robles – but Everton dominated the early stages of the second half. Caballero blocked Barkley's angled shot after muscling Otamendi off the ball, while half-time substitute Martin Demichelis almost turned Leighton Baines' cross into his own net. Seamus Coleman allowed Aguero to turn him far too easily and lay on the pass for the equaliser. City, with all their quality and experience, should have at least seen out the game from there but Barry's inviting cross asked to be finished off and Lukaku obliged with a powerful header. 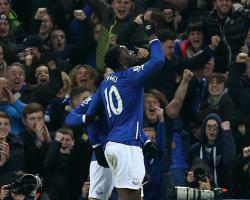 The hosts finished the match with 10 men as Coleman hobbled off after Lukaku's departure used up their third substitute – but in the short time which remained the visitors could not make the numerical advantage pay.